Welcome to all the new swimmers that have been showing up (see photo below from yesterday). The conditions keep getting even better down at Nantasket. No jellies or stingrays to report and yesterday’s water was clear and calm. We expect more of the same this weekend. This Sat., June 16 starting at 10am (gathering at 9am) there will me a one-mile swim in Dorchester Bay to celebrate Jim Doty, a legendary open water swimmer and founder of the New England Marathon Swimming Association. It’ll start from the L St. Bath House (M St. entrance of the Curley Community Ctr). No cost, but donations to the Mission Haiti (www.sawgrasschurch.org) are accepted. Contact Greg O’Conner for more info at gregoc@rcn.com. 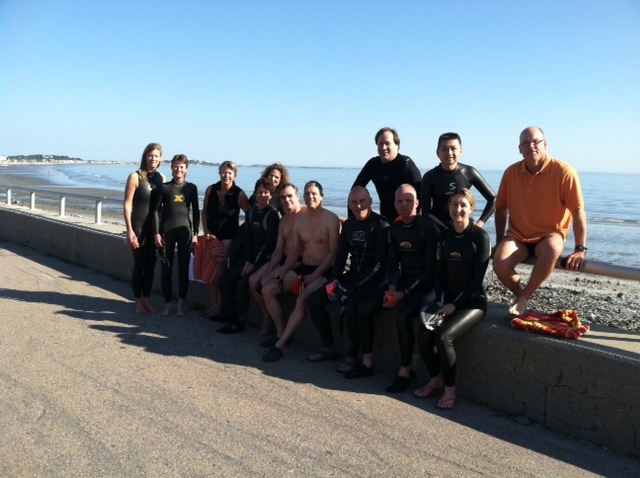 This Sun., June 17, we’ll be meeting at Nantasket at the same time, 7:45 and in the water by 8:00 am. Coffee will hopefully return this week. And in two weeks on Sun., June 24, space is still available for the one mile swim only leg/race of the Cohasset Triathlon (http://www.cohassettri.com/). Elizabeth Warren is rumored to have signed up for the swim so as not to be outdone by Scott Brown who is a rumored participant in the triathlon. Could the post-event activities include a campaign debate to settle once and for all which candidate would best represent the growing voting bloc of striped bass and lobster or will they pander to the politically influential but shrinking numbers of sea lions off the shores of Chatham? Only way to know is to get out for the swim. Lastly, we don’t want to limit organized swims to Sunday or at the 8am time slot. Folks are heading out at various times throughout the week and from different locations. Feel free to email us at swim@crustybarnacles.com and we’ll add you to the email distribution list where you can connect with other swimmers.